Amos Goldreich Architecture and Jacobs-Yaniv Architects have unveiled plans for a purpose-built shelter for women and children suffering domestic abuse in Israel. London studio Amos Goldreich Architecture and Ramat HaSharon-based Jacobs-Yaniv Architects collaborated on the design for The Ada and Tamar De Shalit House, which was commissioned by Israeli charity No To Violence. The organisation was founded in 1977 to raise awareness of domestic abuse in Israel, as well as to provide support for survivors. Its work is led by human rights activist Ruth Rasnic, who was awarded the Israel Prize for her contribution to the field. The building will provide the charity's first centre for female victims of domestic violence and their children, as well as housing its administrative headquarters. "Normally homes are improvised in existing buildings and fortunately this new home will be suited especially for the mothers and children who desperately need a place to live safely," said Amos Goldreich. The shelter will feature a central courtyard and cloisters, and will be able to accommodate up to 12 families in individual quarters. It will sit on a 1,600-square-metre site in a quiet residential neighbourhood – although the exact location is being kept secret. The walled gardens and building were conceived as a small village, providing accommodation as well as a kindergarten, computer and laundry rooms, and kitchens. "Central to the brief from No To Violence, the charity that commissioned the shelter, was the provision of a safe environment for its occupants," said Goldreich. "In response, we created a building with two facades: the secure and protective external facade, and the inner aspect, which overlooks the internal." "Another important priority was to create a sense of home for the inhabitants. Our approach was to design the building as a small village, accommodating a variety of functions. On arrival, each new family is given a small house that is part of the larger building." Rooms and offices will also be provided for live-in staff, as well as visiting social workers, a child psychologist and a lawyer. "The shelter will provide a much-needed refuge for abused women," said Rasnic. "They arrive in a state of real distress, these people have deep psychological problems, as do their children, so the shelter must provide them with a tangible sense of calm and security." "The architects have created a miracle, really, a place where people of disparate backgrounds can come to terms with their individual trauma." American landscape architect Eran Schlesinger will donate indigenous planting and a herb garden for kitchen staff. 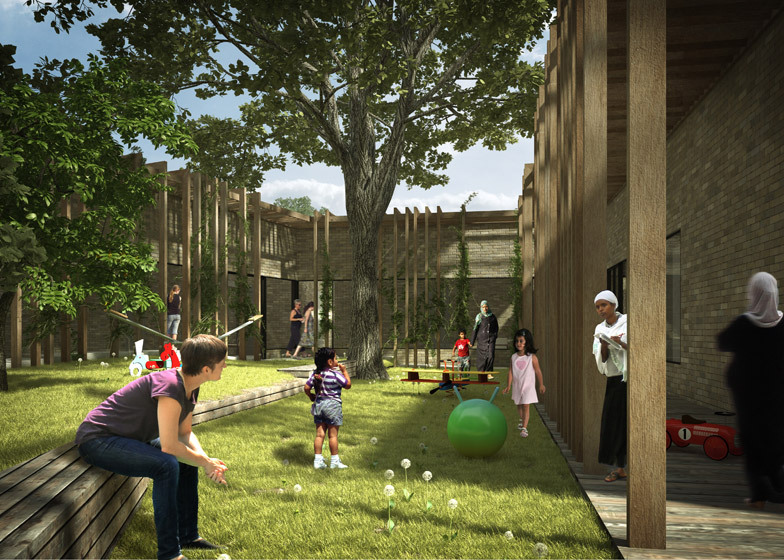 The courtyard and surrounding gardens will also feature children's playground equipment. The shelter will be built from locally sourced materials. It will use solar panels to heat water and will be naturally ventilated to minimise its impact on the environment and to keep running costs low. Architects Tamar Jacobs and Oshri Yaniv founded their studio in 2004. Past projects by the duo include a pilates studio for Paralympic swimmer and a 1950s-inspired fit out of a Tel Aviv apartment. Amos Goldreich is the son of interior designer Tamar de Shalit and Arthur Goldreich, who was instrumental in the establishment of the South African Communist Party and the African National Congress. He provided refuge for Nelson Mandela in 1961 from the apartheid government at Lilliesleaf Farm in Johannesburg. The Ada and Tamar De Shalit House, which is named in memory of Goldreich's mother and grandmother, is set for completion in February 2017.